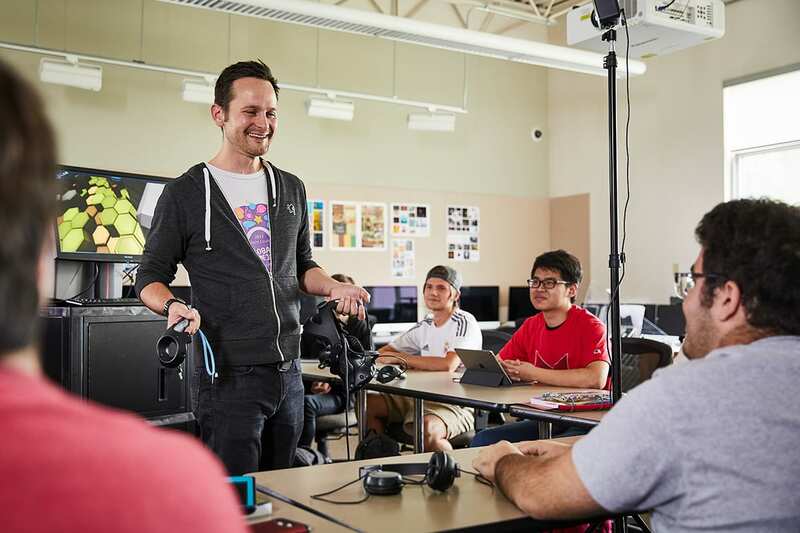 Students pursuing a game design concentration within Maryville’s Interactive Design Program learn real-world skills from an industry leader. Matt Raithel, instructor of game design, is also the owner and studio director of Graphite Lab, a St. Louis-based company that develops video games for brands like Hasbro, Disney and Cartoon Network. The company recently released “Hive Jump” on Nintendo Switch and Xbox One. In the game, players become space marines who fight against an alien hive to reclaim a planet for mankind. The multiplayer game is a nod to retro gameplay, featuring artwork and functionality reminiscent of classic arcade games like Donkey Kong, Raithel said. Graphite Labs initially gained interest for the project through a Kickstarter campaign. After securing more than $50,000 in startup capital, the team spent nearly five years and 15,000 hours developing the game. Team members included Maryville alumni David Greenfield and Jordan Covert, and Maryville adjunct professors Matt Stevens and Rob Santos. Raithel incorporates industry best practices he learned in the process into his game design curriculum. “It’s very important I share my professional experiences with my students so they can understand how things like budget, timeline and marketplace trends impact the success of a creative endeavor,” he said. These skills are particularly useful when students are putting together their portfolios and speaking with potential employers, he said. Maryville’s game design concentration has grown substantially since its launch in 2016. Last spring, Maryville celebrated its first graduates from the program. For more information about Maryville’s Game Design Program, please click here. For more information about “Hive Jump,” visit hivejump.com or purchase the game via the Nintendo eShop or the Microsoft Store. Thank you KSDK and Fox 2 Now for your coverage of this good news!